The glories of Easter and Eastertide lift me into familiar joy, one that I expect each year. And yet this joy surprises me with its nuances, colors, and music: the lilies on the altar, the flaming candles, the removal of the purple coverings, the triumphant hymns and processions. Easter often signals the arrival of spring, and the natural world reflects the supernatural with sunshine. This Easter in the Bay Area a long desired rain descended from the heavens, splattering our dry California soil. It was a too-short rain that came and went quickly, but it peaked Easter morning. Still we were dry inside the ark of the church. After the Scripture lessons and Creed, and before the sermon, the children flowered the thick white Easter Cross placed at the foot of the altar steps. They shoved bright blossoms into the deep holes, and watched the wood of the cross come alive. Just so, I thought, Mary Magdalene came to the empty tomb and found the living Lord walking in the garden. 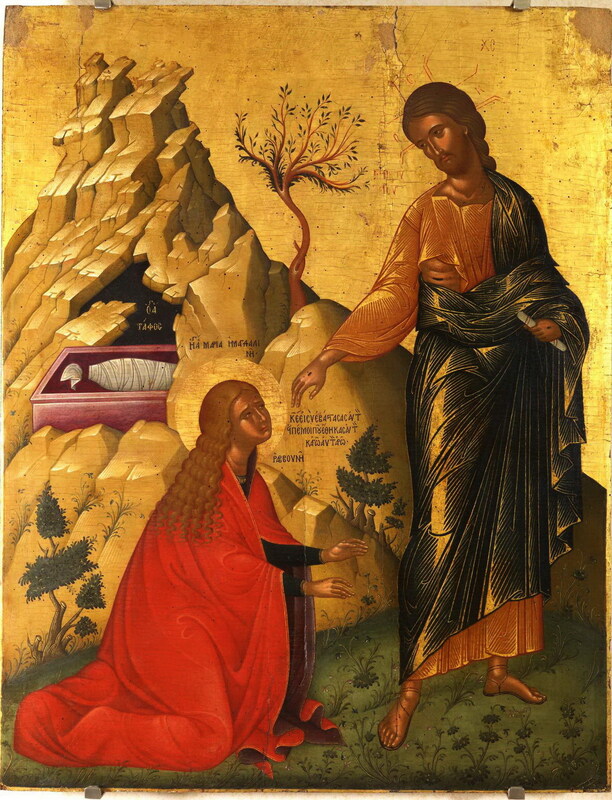 The Gospel appointed for Easter Day, the highest holiest day of the Christian Year, details Mary Magdalene’s visit to the empty tomb in a manner found in histories, not myths or legends. These specific details had been passed from one generation to another orally in the early Church, and were recorded decades after the event. So it is not surprising that the accounts vary a bit, but in the essence they are the same: Jesus, their Lord, had risen from the dead. The accounts agree on another key fact, that the women, not the men, made the discovery. Had these resurrection stories been invented, those who found the empty tomb would have been men not women. And yet, remarkably, the apostles did not find the tomb first; they didn’t even believe the women when they ran back to their hiding place and told them. It is Mary Magdalene who makes the discovery, and at first she doesn’t understand what has happened either, thinking the body has been stolen, a detail that could not have been invented. She saith unto them, “Because they have taken away my Lord, and I know not where they have laid him.” And when she had thus said, she turned herself back, and saw Jesus standing, and knew not that it was Jesus. The risen Christ makes numerous appearances on earth before his ascension to Heaven, but even with these accounts, many today do not believe in the resurrection of the Son of God. Some of us need help, it seems. I was one of those. I was converted by reason, arguments I read when I was twenty, made by C.S. Lewis in Mere Christianity. I made that first step of faith (I didn’t feel I was leaping) and found an Anglican church (Lewis was Anglican) to find out more. Experiencing my first Anglican liturgy in the spring of 1967, I was entranced, overwhelmed by beauty. I began the dance of a lifetime, weaving Heaven into my earthy world. I am still dancing, learning new movements and new steps, and enjoying the many other dancers in the Body of Christ, the Church, who dance with me and alongside me, helping and teaching me. 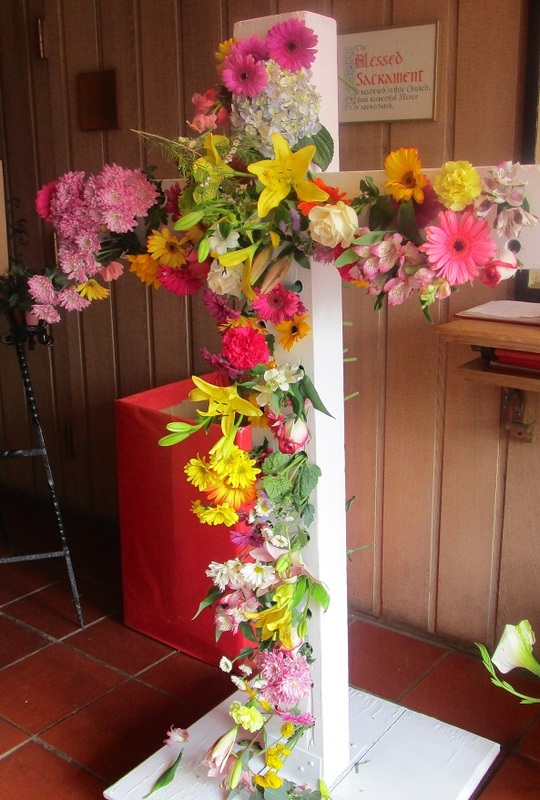 And so, each Easter as the dead wood of the white cross comes alive with reds and blues, greens and yellows, pinks and purples, flowered by the children of our parish, I am thankful. I am thankful for Mary Magdalene and her faith and her witness to the glorious Resurrection of Christ; I am thankful that I could tell her story in my novel, The Magdalene Mystery, and in the telling understand how truly historical those resurrection accounts really are, deepening the belief I found forty-seven years ago, strengthening Lewis’s reasonable reasoning. But most of all I am thankful for the Son of God among us, having risen on Easter morning, having walked the earth to appear to many, and with us today in the Eucharistic gifts of bread and wine. I rejoice in God’s great love: to be born among us, to live, die, and rise again, to take us with him into eternity in this world and the next. This entry was posted in Uncategorized and tagged belief, children, Christ, Easter, Eucharist, flowers, Gospel, love of God, Mary Magdalene, Resurrection. Bookmark the permalink. Dear Christine: Your talent for the language grows better all the time: “The dead wood of the white cross comes alive with reds and blues, greens and yellows, etc.” showed me the blooming of color and life in your word picture. Likewise, “I began the dance of a lifetime, weaving Heaven into my earthy world.” I am intrigued by your use of the word “eathy.” I expected to see ‘eathly’ and was delighted with “earthy” because for me is invokes the richness of Christ’s Gospel–God created Man from the dust, and Christ used spit and mud to cure the blind. Such things make you writing a joy to read. PS: I have pulled my copy of the “The Magdalene Mystery” to read again as I suspect I’ll find more nuggest to think about. Thank you. God bless you and may you have a blessed year.